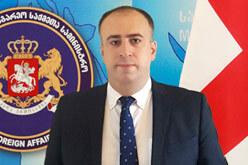 2.04.2018 – As part of his visit to France, the Georgian Deputy Foreign Minister, Zviad Gonadze called on the Georgian Sunday School set up in Strasbourg. The school will function at Georgia’s permanent representation to the Council of Europe. The Ministry of Foreign Affairs provided the school with necessary supplies and inventory, as well as with respective training materials. Along with other activities, the Sunday School plans to conduct various cultural events for Georgians living in various regions of France. The Sunday School includes up to 80 children who will attend classes in Georgian language and literature, history and art. It should be noted that the Sunday School was set up in Strasbourg through the support of the Parliamentary Committee on Diaspora Relations.